Koge Bugt Glacier is an outlet of the Greenland Ice Sheet on the southeast Coast. 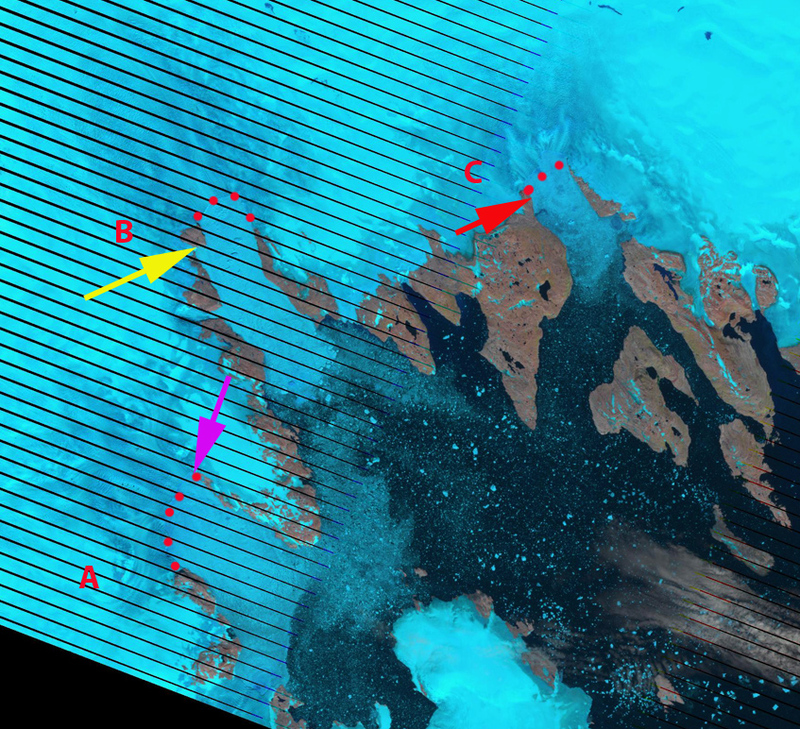 The glacier empties into the bay of the same name, and has three main calving fronts. This glacier is the the sweet spot for high snowfall and hence, despite its smaller size is one of the larger outlet glaciers in terms of volume. Koge Bugt Glacier is not an oft mentioned glacier it is not as fast as Helheim or Jakobshavn, does not have as long a calving front as Humboldt Glacier. 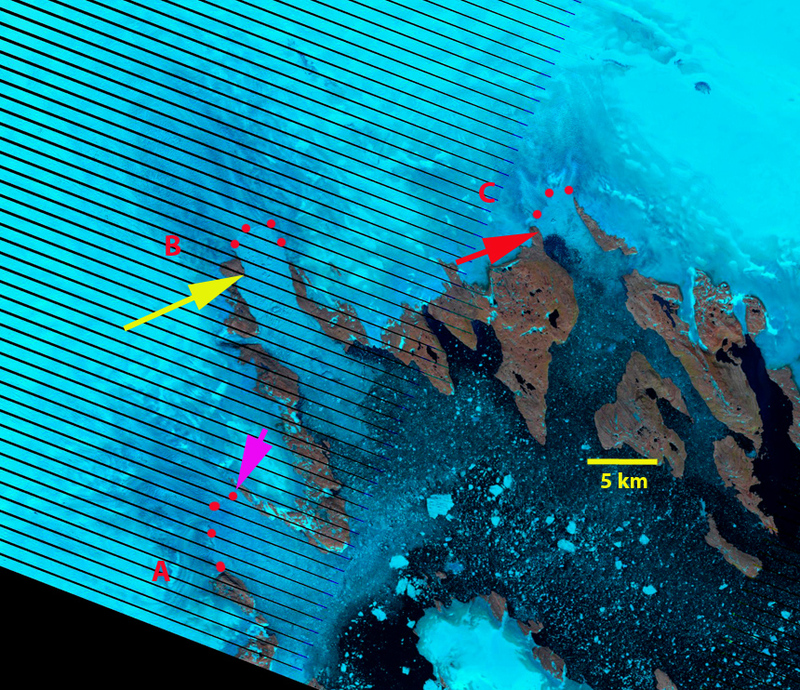 Does not calve icebergs nearly as large as Petermann Glacier. Does not penetrate into the midst of the ice sheet as far as Zachariae Ice Stream or 79 Glacier. However, according to observations of Enderlin et al (2014), Koge Bugt has the second largest volume flow for the entire ice sheet. They further note that the glacier has had the third greatest volume anomaly since 2000, that is increase in discharge. 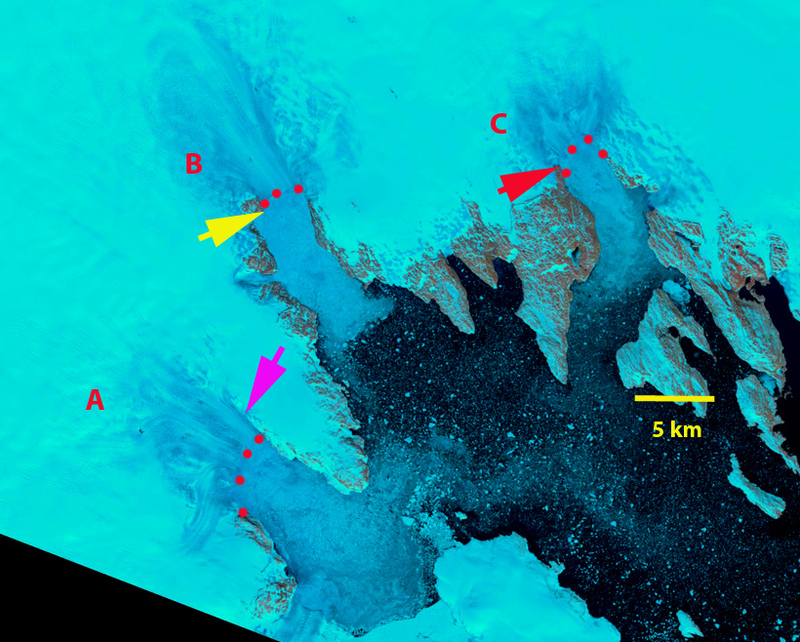 Murray et al (2010) indicate Koge Bugt had accelerated and thinned in concert with other glaciers in the region. The second image below is Figure 1 from their paper indicating the 27,000 square kilometer drainage area of Koge Bugt. Howat and Eddy (2011) examing 210 outlet glacier in Greenland noted that 191 retreated from 2000-2010 including 89% in SE Greenland. 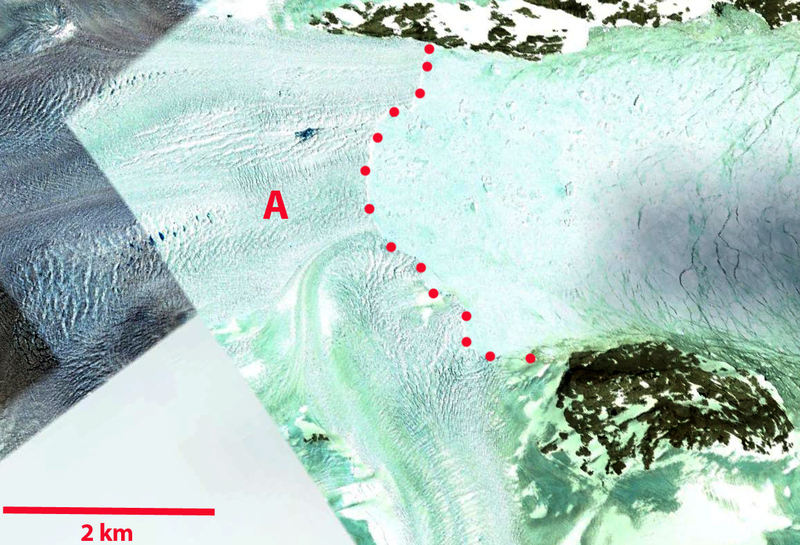 Howat and Eddy (2011) data indicated limited retreat of Koge Bugt Glacier before 2000. From 2000 to 2010 they noted a retreat of 2300 m of outlet C, 1650 m for outlet B and 300 m for outlet A. 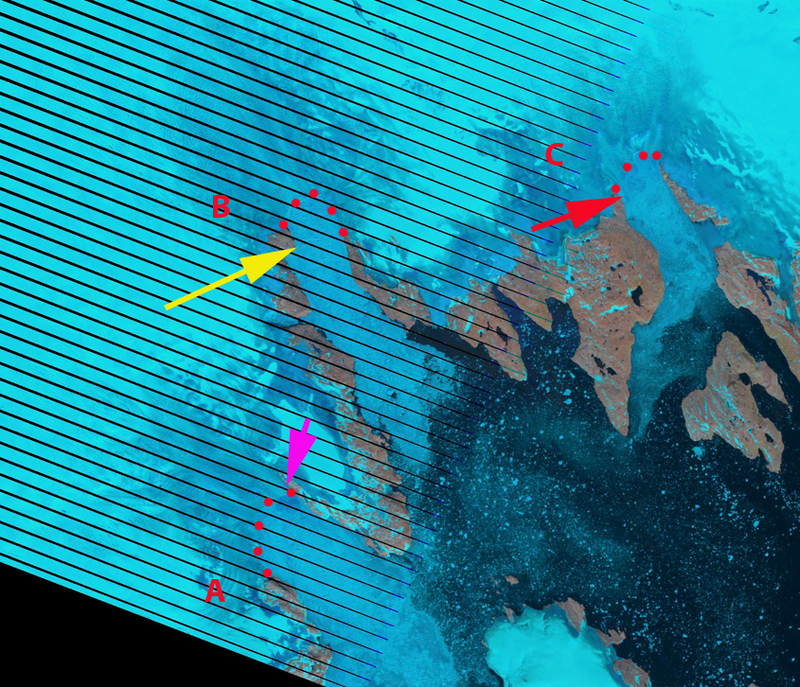 Each of these outlets has a heavily crevassed active calving front having widths of 5000 m for A, 3500 m for B and 3500 m for C. Outlet B has calved a large iceberg, and there is a substantial rift near the calving front. Greenland Velocity map with Koge Bugt indicated by red arrow. 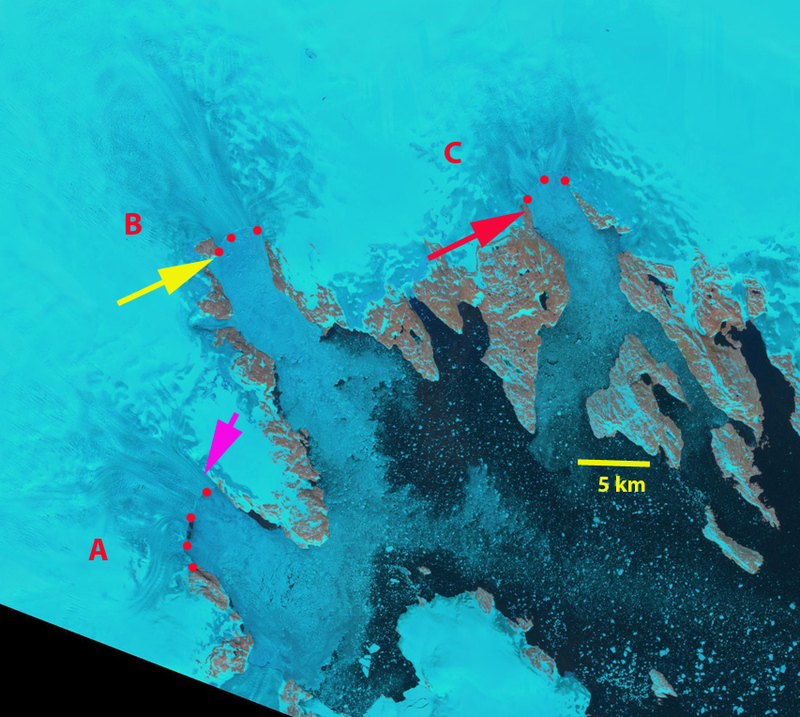 Danish Geologic Survey map of Koge Bugt area, outlets labelled A-C.
Below is a sequence of Landsat images from 2001-2013 of the Koge Bugt Glacier three main termini. In each case the red dots indicate the calving front, the purple arrow is at the same spot on the north side of terminus A, the yellow arrow at the same spot on the west side of terminus B and the red arrow at the same spot on the west side of terminus C. From 2001 to 2011 terminus A has retreated little on the south side, but has retreated 1.5 km on the north side. Terminus B has retreated from halfway along the island on the southwest side of the terminus to the north of this island by 2011, a retreat of 2.2 km. 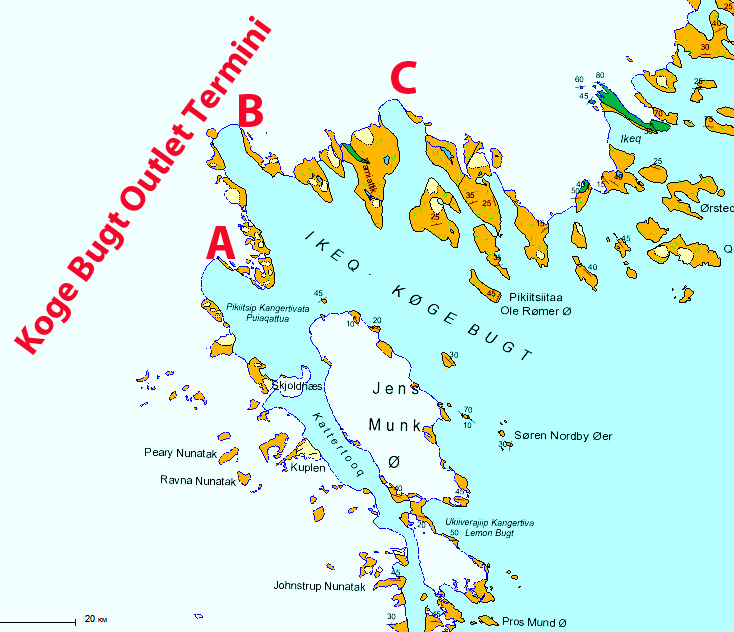 Terminus C has retreated beyond the north end of the Peninsula noted by the red arrow, a distance of 600 m. Given the size and velocity of Koge Bugt this is a minor retreat, that can be erased by a year with more limited calving. 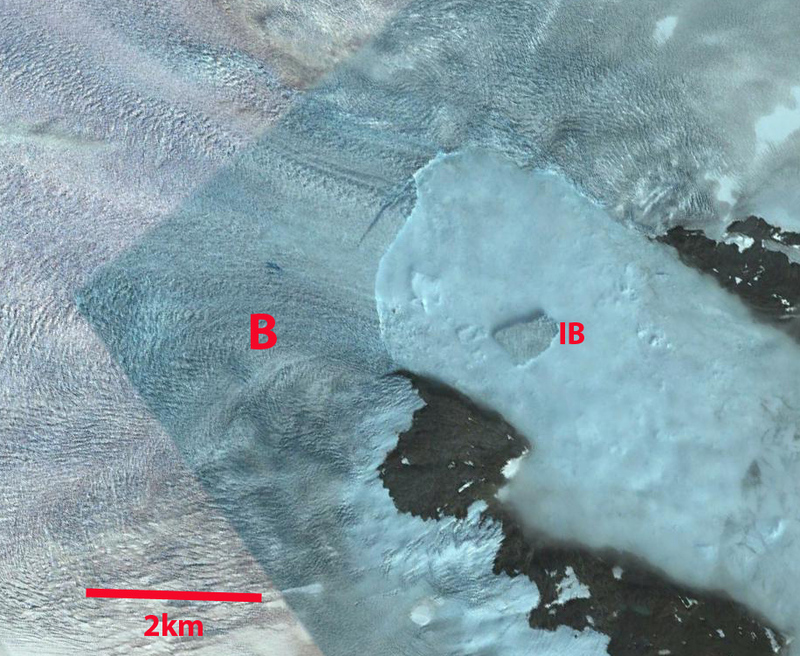 The melt zone in these July and August images indicates how limited the ablation zone is compared to the west side of the ice sheet, this also limits the occurrence of supraglacial lakes. 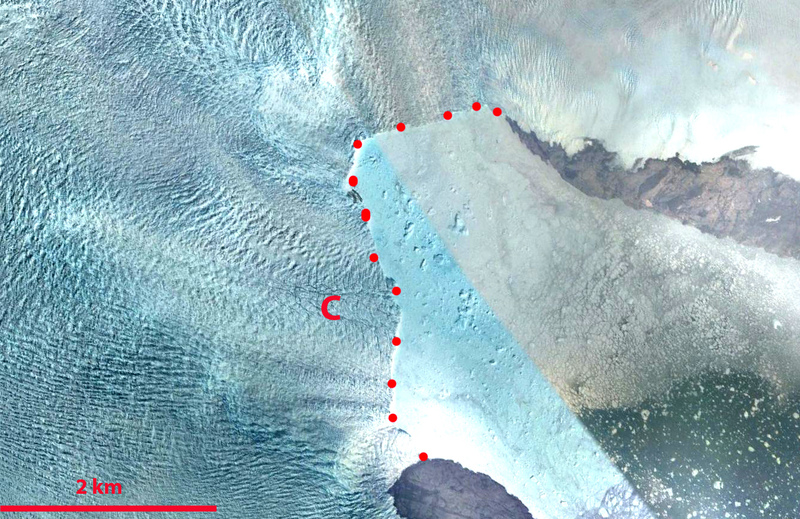 This entry was posted in Glacier Observations and tagged Greenland glacier retreat, Koge bugt Glacier, Koge bugt greenland. Bookmark the permalink. don’t you think cryo hydrologic warming is doing its thing here too ? No, I do not. 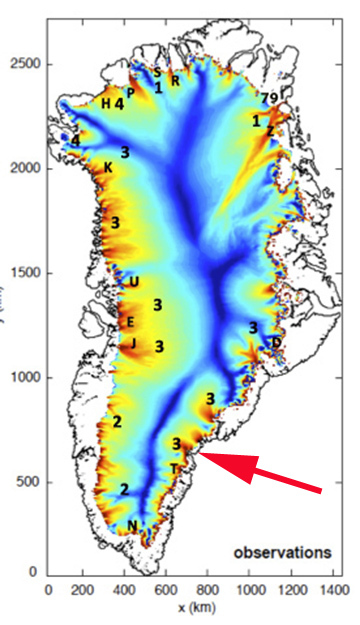 Phillips et al (2013) was focussed on sw greenland. Here we have much higher accumulation rates and lower ablation rates, both would reduce the aforementioned. The acceleration that generates retreat here is probably from ocean warming leading to more melting of the terminus and acceleration more limited to the near terminus region.